The annual program is back for another amazing summer! It is a hands-on, minds-on learning experience unlike any other! This event is the premiere professional development program for K-12 teachers, college educators, librarians and media professionals. KEYNOTE SPEAKER: Dan Gillmor, Arizona State University, author of Mediactive. Dan's video welcome. Julie Coiro, University of Rhode Island. Julie's video welcome. Troy Hicks, Central Michigan University. Troy's video welcome. Yonty Friesem, Central Connecticut State University. Yonty's video welcome. Kristin Hokanson, Inquiry Schools PA Kristin's video welcome. Kara Clayton, Thurston High School, Redford MI. Kara's video welcome. Emily Bailin Wells, Columbia University. Emily's video welcome. Amanda Murphy, Westerly High School, RI. Amanda's video welcome. William Yang, Edgewood School, Scarsdale, NY. William's video welcom. Stephanie Branson, University of South Florida. Stephanie's video welcom. Jen Robinson, Thompson Middle School, Newport RI Jen's video welcome. Beth Dobler, Emporia State University. Beth's video welcome. Jay Fogleman, University of Rhode Island. Jay's video welcome. Frank Romanelli, University of Rhode Island. Frank's video welcome. Event Producer: Carolyn Fortuna, Media Education Lab. Carolyn's video welcome. Who Will Participate? 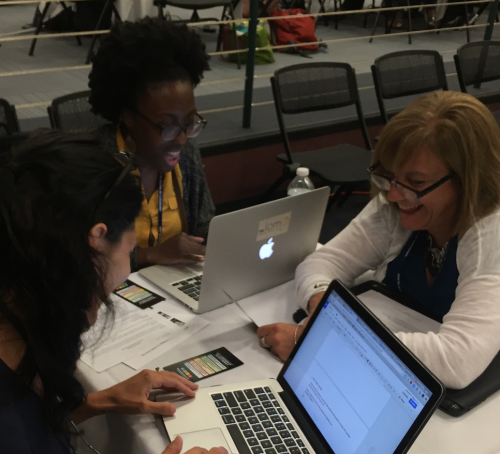 The Summer Institute in Digital Literacy attracts more than 130 talented people, including K-12 educators, school and public librarians, college and university faculty, graduate students, researchers, ed tech entrepreneurs, media professionals, and media literacy and youth media leaders in the informal learning sector. 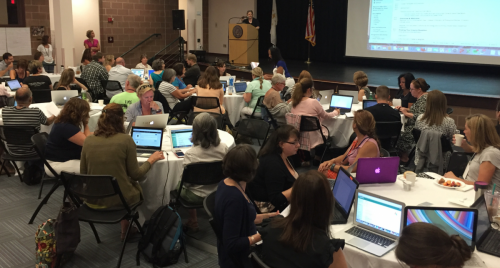 We use the hashtag #digiURI for year-round networking. JOIN US THIS SUMMER! Transportation and Lodging: Learn more about how to plan your travel. Format. It's a hands-on, minds-on learning experience, where you discover the power of digital literacy through intensive collaboration with a partner, creating lesson plans, units of instruction, and several different types of multimedia creative products. Tips & Tools: Get plenty of hands-on learning-by-doing, choosing from a range of workshops where you explore technologies such as blogs, wikis, collaborative writing tools, video production, informational websites,iPads, and personal learning environments (PLE's) to foster online learning, critical thinking, creativity and engagement. Amazing Texts: Amazing Texts sessions are designed to inform participants of digital resources (websites, videos, books, games or interactive media or online content) that have value for teaching and learning. 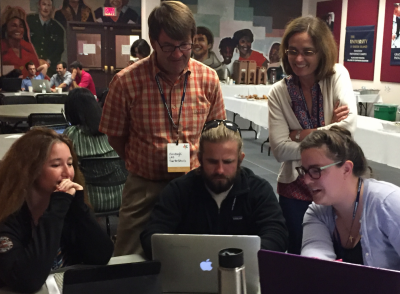 Promising Practices: Promising Practices Sessions are designed to share digital literacy lessons or ideas that you've tried out or that you think have the potential to engage and inspire learners in a particular context. Research Roundtable: Research Roundtable Sessions are designed to give you time to share your most recent work, network with others interested in research, and obtain feedback from participants and digital literacy scholars. Leadership Track: Participants returning for a second year may select the Leadership Track, learning to address management issues of how to lead teams to advance digital literacy through the creative use of digital media and technology. Fees. Program Fee: $750. Includes program materials, opening reception, lunch and daily refreshments. All participants receive a certificate indicating completion of the 42-hour intensive program. You can also earn 3 graduate credits by completing additional assignments for an additional $350 (or flat fee of $1100). GRADUATE CERTIFICATE IN DIGITAL LITERACY. The SUMMER INSTITUTE IN DIGITAL LITERACY is part of a 12-credit graduate certificate program offered by Professors Hobbs & Coiro. The Graduate Certificate Program was recognized in the 2016 U.S. Government's National Educational Technology (NET) Plan. Fall and Spring courses are taught fully online. The fee for enrolling in each Fall and Spring online course is $1,965. NOTE: Tuition waivers do not apply to this program. You can become a recognized leader in digital literacy! 75% of participants have rated the Summer Institute in Digital Literacy the BEST professional development program they have ever experienced in their entire career! How are identity and power relations depicted in media texts and textual activity?